My E36 has experienced a major coolant leak that’s coming from behind the motor. Initially I thought that one of the three lines that attach to the heater core was loose, but I got a chance to get in there and tighten the hose clamps. I see that two of those lines go to the heater control valve; those are fine. But the third line I’m guessing goes to the motor? 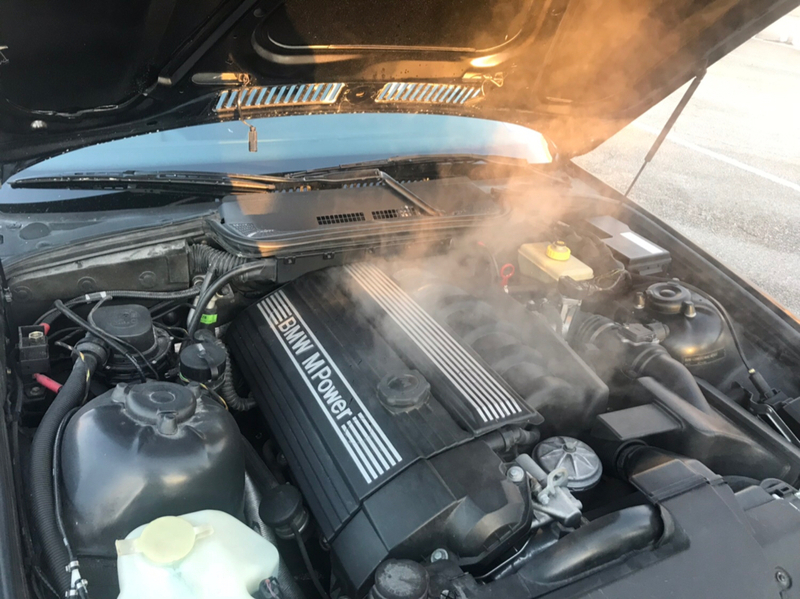 Now, after letting the car idle for about 10 mins (I guess when the fluid is warmed up and system is pressurized), hissing and coolant vapors originate from the third line, under the intake. I was wondering if there is easy access to this hose with the intake removed. Removing the E46 M3 intake is a PITA...how bad is removal of the E36 M3 intake? If it turns out to be that hose, should I go ahead and replace it as well as all of the other coolant lines back there? They all look original. So far, I’ve removed this part, so I have a good visual on all of the lines except the other end of the third hose. I think it’s this line? Intake manifold removal isn't too difficult but it is time consuming. You'll definitely need to remove it to fix the issue you're having. If you think removing the E46 M3 plenum is hard (it is not at ALL), you'll hate doing the E36. It is by far harder to remove. I'd replace all the water hoses back there while you are in there. You don't want to have to go back in. I replaced all mine and the clamps (BMW OEM clamps) as well. Once the manifold is out everything is pretty accessible. Include throttle body coolant hoses and the dual orings on the hardline that is under there. Cool. I’ll take a look at what’s back there once the manifold is out. I’ll follow up in this thread if I can’t figure out PNs for specific parts. I would not take the manifold off for that personally. I would get it from underneath. The factory clocking of the block side hose clamp is up. You will need to access it from above. I can’t picture how easy the job as whole will be from underneath. i agree it won't be easy and will result in scraped arms but i'd do that over pulling the intake, replacing gaskets and praying for no vacuum leaks at the end of it. Another idea is to get an M50 manifold and swap it in at the same time. Upgrade and maintenance at the same time! All times are GMT. The time now is 04:13:21 AM.